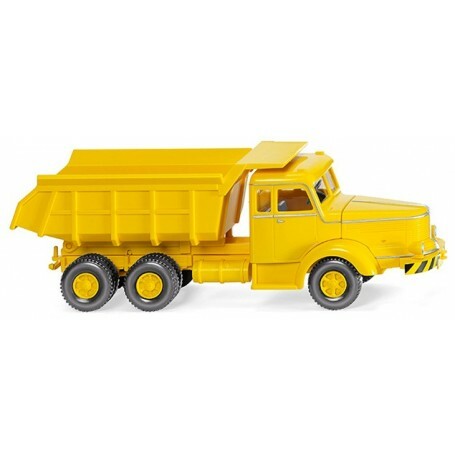 Tipper trailer (Krupp Titan) - yellow, 1950. Driver's cab with hood and tipper frame with lifting cylinder and tipper body along with chassis and fender traffic yellow. Wheel rims likewise traffic yellow. Interior with steering wheel anthracite grey. Black marker poles are included. Hood with silver ornamental strips, driver's cab with silver ornamental strips and bumper with black-yellow warning hatching. Silver-painted headlamps. Ornamental strips along the engine hood and driver's cab with silver door handles. Headlamps hand-painted in silver.